Being by my reckoning the fifth of Brogues’ ‘Foolin’ Around’ gigs, and the first since this all-conquering Pastels / Tenniscoats show. The first, too, Chris noticed, not to be held on a Thursday. ‘How did you manage to forget which week one of them was in and still remember the day?’ I wondered, but he was too pleased with his new painting of Freddie Mercury from Mono’s Project Ability exhibition to mind much. Ooh, Project Ability have a Flickr page, I didn’t know that. We wondered, anyway, whether the day of the week was what had kept the audience numbers down: there was plenty of low key atmos, and those who were there were appreciative, but – you could’ve tried a bit harder, Glasgow. Especially as what you missed was top notch. Having narrowly missed Water Wolves supporting Real Estate in January (seat... or support band? ), it was good to have the opportunity to catch up. Brogues has compared their guitar lines to the Go-Betweens, and listening to their MySpace songs I do agree (do you know that early Robert song ‘Hope’? ), but in the flesh they were far more on the wavelength of The Clean, with the fluidity of the sound, the reluctance to change chords, the easy-going frailty. The two guitars took turns at being the bright, trebly one, and the drummer in his tank top looked like an extra in a Philip Larkin documentary. Maybe this kind of thing works best live, but I wouldn’t discount the possibility of a magic all the Wolves’ own. A girl at the front shouted out something about ‘I Wanna Be Your Boyfriend’, and I couldn’t work out if it was because the previous song used the same chords or because the following one stole some of the lyrics. But nothing could be further from the Ramones: this was un-regimented, de-regulated, ramshackle as a sparkler. Not so The Lodger, who are a highly organised bunch. The second bearded singer of the evening looked much more like a morning person, with his Green Flash trainers and lightening fast guitar arm. He wouldn’t make a great substitute for Ivor Novello in the film from which (I presume) his band took their name – too open, too honest for that ambiguous character. To begin with, on stage as on record, The Lodger can come across as plain: a whirlwind of activity neatly tidied away into a teacup. But then you tune in. Their appeal is not in the surface of the sound but in its drive and urgency. Especially thrilling are the lurches into disco – particularly on set closer ‘The Good Old Days’, a great, great single which should come with umpteen extended 12” mixes. Other attempts to deepen their sound are in evidence: Ben introduced one song from the new LP by saying that really it is stuffed full of saxophones, but that the logistics of getting the extra musicians into the band’s Vauxhall Corsa all the way to Glasgow meant that we would have to imagine them. They are doing the full orchestrated version in Leeds soon. ‘Let Her Go’ was deployed at the set’s mid-point, a ball of energy oddly reminiscent of Subway Sect’s lethargic ‘Turn Your Back On Everyone’. ‘Many Thanks For Your Honest Opinion’ – ‘one of the first songs I ever wrote’ – was more fiery still. A. was even reminded of Passion Star, for the tender hearted self possession. That is a compliment indeed. The Lodger kicked up a storm. An unexpected effect of the book was that it made the things it led me to look up seem fake. It is heavily referential throughout, nearly every page sent me to Google, and what I found on the internet was often written in the same factual style as the book itself. A mention of McCaig’s Folly, a fake Roman amphitheatre in Oban, led me to this website, and the first sentence there, ‘Oban stands unchallenged as the capital of the western seaboard of Scotland’, could easily be the start of another of Momus’ Scotlands. The fact that I knew about McCaig’s Folly, and have seen it many times (though I didn’t know its name before), wasn’t enough to make the real website ring true. But I believed in Momus’ fakery (as fakery), because it was on paper. If an individualistic society is vertically structured, with everyone chasing the same goals, ‘Scottish society is superflat, diffuse’. Your job gives you a place within it. In the book version, the narrator actually becomes the driver, and gets to feel his pride. It seems very much like a happy ending, but there is a problem with it: the narrator has swapped curiosity for a contentment which never looks beyond itself. And Momus would not be Momus if he did that. 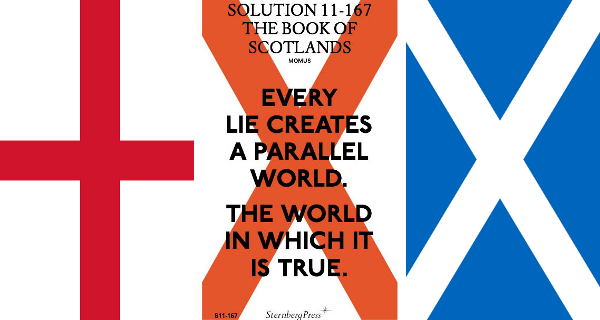 Update: Chris points out, ‘the perpendicular St Andrew’s cross on the front cover isn’t in the colours of the English flag – it’s Pantone 1655 (ref. Scotland 23)’. I dunno though, it looks red and white to me. This popped up on Dad’s Amazon recommendations, as a result, he can only imagine, of buying comics for me, demographically shazam’d together with the kind of philosophy / maths things he tends to be interested in. It only goes to show – if you can imagine it, it probably exists. Left to my own devices, I think the awkwardness of the first part of the title together with the haughtiness of the second would have been enough to put me off. Not to mention the central conceit – to tell the story of Bertrand Russell’s attempt to establish a logical foundation for mathematics, through a comic. Is this really the best medium? Regarding the philosophy side of things, I am not remotely qualified to say, but in terms of creating drama out of academic crises, it succeeds, and spectacularly. A niggle remains that it must surely leave out most of the arguments upon which its own drama is based, but it’s not like I was ever going to read Principia Mathematica, Wittgenstein’s Tractatus Logico-Philosophicus, or indeed anything without characters and a story. This is the compromise Logicomix makes: just because the stuff in which it deals is very complicated indeed, doesn’t mean it isn’t important; and if it’s important, its story deserves to be told. This is his moment of triumph, but it proves so problematical that it is easy to forget the Russell who arrived at it during the pages which follow. He grinds to a halt in his attempt, despite the paradox, to stick with logic: Principia Mathematica is written with the mathematician Alfred Whitehead over the following decade, and published between 1910-13. During the same period, Russell becomes estranged from his own wife and falls for Whitehead’s. The book sours at this point, losing the charm of a fierce young intelligence taking on stuffy old mathematics with a fond new wife in tow. Russell appears to consider Principia Mathematica a failure, and is reluctant to publish – which hardly anyone wants him to do anyway. It is redeemed much later in the story by Kurt Gödel, who uses its methods to prove the conclusion it is apparently desperate to avoid, that there are mathematical truths which not only haven’t been discovered, but which are also undiscoverable. Russell: The ‘Picture’ theory is clear enough. But it gives us truth only because of the underlying higher language of logic. Wittgenstein: There you go again! There’s no such thing as a ‘higher language’! Truth comes in only one variety! A ‘Picture Language’ is all you need to describe the world, i.e. all the facts! The italics and exclamation marks do look better in speech balloons, by the way. The end of that passage encapsulates the moral of the book. The whole thing is told from within two frames – firstly, the team who wrote and drew it appear as characters, allowing a built-in commentary on the flow of the narrative; and secondly, Russell gives a lecture to an American audience in 1939, which provides the narrative impetus and voice for his own reminiscences. His facial expressions during this talk, and the contrast between ‘now’ and his gradually ageing younger self are probably the best thing about the artwork, it is remarkable to watch him grow into himself. The lecture is picketed by protesters who don’t want the US to enter World War II – they want Russell’s support, reminding him of his pacifism during World War I. Nazism is an example of a rigid logical structure imposed on real life – the ultimate example, in fact, of why this is a bad idea. Frege, one of the men behind set theory, is shown late on as a crazed Nazi sympathiser. So if the main achievement of Russell’s life was the fleeting moment in which he established that mathematical logic must be flawed, and if he tired himself out failing to disprove this over many years, what exactly is this book celebrating? The author-character Christos stands up for Principia Mathematica as the basis for Gödel’s breakthrough, and claims that with the holy grail of a perfectly logical mathematics gone, the way was clear for people such as John von Neumann (who was present at Gödel’s lecture, and reacted by saying ‘It’s all over’) to concentrate on what maths could actually be made to do, and – voilà! – you get the utopia of the internet. Without exactly knowing why, that seems suspect to me (the internet as a paragon of how not to waste time down esoteric blind alleys? And why did the practical have to wait until the impractical had been proved impossible?). All the same, a beautifully drawn, entertaining read, and an illuminating juxtaposition of politics and science during the first half of the twentieth century. * You may notice a pattern forming here. Is Jane Eyre ever happy unless she has carried her point over Rochester? Agnes does not value argument as Jane does, she does not need to say something to appreciate it. Which gives us a slim volume, often rather bald in the way it presents its events. The plot early on is episodic (doubtless the life of a governess would have been). It begins at her home, the Parsonage in an un-named seaside village, but quickly moves to the house of Agnes’ first employers, the Bloomfields. The children are spoilt and out of control, the parents give Agnes no support, the grandmother is devious. After a while, having made no headway, she gets the sack – and a quarter of the book has gone, before she has reached the scene of the book’s main action, in the employ of the shallow, stuck up Murray family. The Bloomfields are never referred to again. The Murray children are older and not quite as bad as their predecessors – they become manageable, at least, after the son has been sent away to school. For a while the story sticks with the conditions of the tuition, and with Agnes’ treatment by her employers and their circle (they are uniformly condescending, when they notice her at all). She is present in her own narrative only as a resisting force, until about half way through the novel, when she begins to have feelings for Mr Weston, a curate. What precedes this is probably the longest stretch of romance-free plotting in a Brontë novel – and it does very well without that focus. 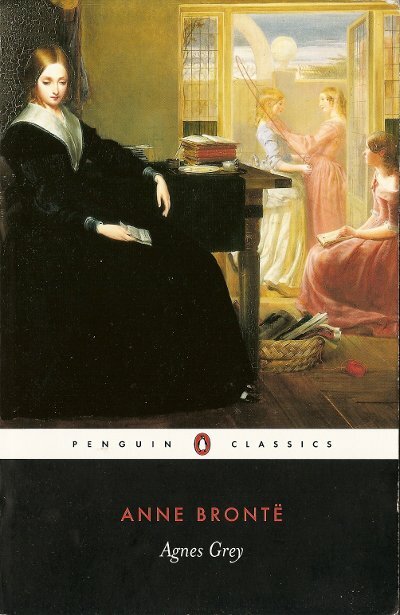 By the end of the book, these feelings have come to dominate, but never quite in the obsessive way that you find with other Brontë heroines. The strength of Agnes’ feelings is not in doubt, but she doesn’t expect her hopes to be fulfilled, and rarely becomes bitter (her self-denying nature and understated Christian faith are at play here). The quietly lyrical chapter ‘The Sands’ is correspondingly touching: it’s just a walk, just a chance meeting. But if it wasn’t meant to be, God would have had a reason for that too: Agnes’ language can be archaic and prim, her moralising often lacks nuance. But I didn’t mind any of that: I liked her.